What better way to end a year of reading & reviewing massive amounts of CanLit than with a book about L.M. Montgomery? I've read all of Montgomery's own fiction works, as well as her diaries, and scrapbooks, and much of the lit crit and biographical work surrounding her life. So of course when I saw this new YA novel based on Maud's life as a young woman I had to read it. It's aimed at the YA market so it is quite 'gentle' in the portrayal of LMM's hardships and disappointments in life. She was a very sensitive child and young woman and took things quite hard -- reasonable, really, considering the unhappiness she felt at being abandoned by her father after her mother died, and then experiencing a secondary rejection when she spent a year living with him and his second wife in Prince Albert, Saskatchewan. Add the difficulties of being raised by strict grandparents who didn't really support her literary ambitions, and the fact of romantic entanglements and impossibilities. While these aren't horrific cataclysmic wars or destruction, these issues did affect LMM's life and development, and Fishbane honestly shares Maud's interaction with all of these elements of her life. I was particularly interested in how the year in Prince Albert would be portrayed, as it was a very hard year for her, and, well, Prince Albert is my hometown. So I've always felt a connection to Maud's desire to be happy there in spite of her circumstances. She did make lifelong friends there, though, who she kept in touch with for years and years, so despite everything she didn't completely hate her time there. 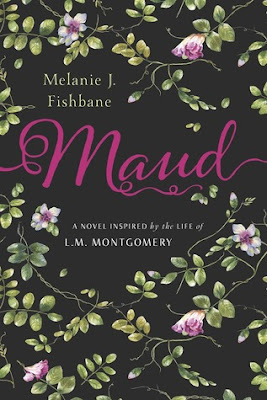 Fishbane shows both the happiness and despair that Maud experienced during the years of this novel. As Maud is first sent off to her father in a bit of disgrace, and then returns to PEI after one long year, her development from child to determined young woman and published author is delineated. If you are a fan of LMM you'll probably want to read this for sure. If you know any younger readers who are fans of LMM they might like this also; the writing style is a bit dry and old-fashioned -- suitably LMMish, so if they do like reading Anne for themselves they will most likely be able to adapt to this style easily. Viewers of the tv shows only might find the style a bit slower going than they are used to in comparison to many current YA/middle grade stories. I'm not generally a big fan of fiction which takes real people as the main characters. I find it can be really off sometimes and even offensive to claim thoughts and emotions for a real person to suit a writer's purpose. In this case, though, everything that Fishbane writes comes directly out of LMM's extensive writings. Nothing is completely imagined or inserted that wouldn't be supported by the facts of LMM's life and experiences as shown in her own letters and journals. I think this would be a great introduction to a writer's life for younger readers who want to know more about their favourite books. This novel has been getting a lot of attention since its release and I think it lives up to it. Who better to read about in this Sesquicentennial year than our best-known literary export? So my verdict is that despite my reservations about a fictional representation of someone I'm quite familiar with, I enjoyed it and thought it gave a good perspective on the beginnings of LMM's career and some of her formative experiences. A solid addition to the LMM world. Melwyk, I'm pleased that you enjoyed this book so much. I'll keep it in mind. I've read work by L.M. Montgomery, most recently the Betsy-Tacy books. Wonderful, thoughtful review, as always!